Firstly,before we look at how to improve our chances of locating and hooking one of these quality trout, a few words about conservation and restraint. The OTFA has a voluntary code of conduct regarding the taking of fish from these “Trophy” fish waters, and this requires the return of all fish under 2lb and the keeping of only 2 fish per day. Personally, I return all my fish carefully nowadays, in the hope that they will grow on and possibly reach the 10lb+ mark, a weight which is very achievable given the abundant and prolific food sources available, and in addition, to land one of these Leviathan’s would top most angling experiences. The pursuit of these large fish is not everybody’s idea of fun as it can be fruitless and very boring with long periods of angling effort for no return, but there are a few things that you can do to vastly improve the odds, and although this approach is not definitive, it should provide the basic information to make a trip to the Isles memorable. The lochs of Bea and North on Sanday are quite similar in both size and shape; both are roughly bowl shaped, maybe 6 or 7 feet at their deepest. The west side on both lochs is hard with the shore made up of small boulders and shingle, the east sides on the two lochs are sandy/silt and much softer and definitely featureless, with North Loch having the appearance of a beach in Spain at some parts. All this makes them very susceptible to periods of great discoloration and high turbidity following strong winds, conditions that seriously limit your chances of locating fish, always keep one eye on the weather forecast. 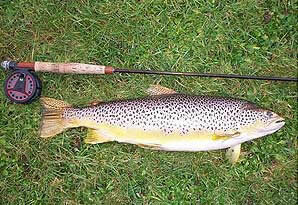 The time of day to fish the lochs very much depends on the time of year and the weather on the day in question. In April and May, you can confidently fish from dawn to dusk in anything other than a combination of sun and wind, and be successful at any time of the day, but as the year progresses and the water temperature rises, angling at first light before the sunrise and then again from sunset until darkness can be your only hope, and help reduce the “flogging a dead horse” feeling. 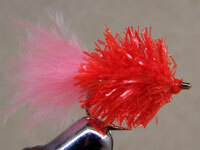 Tackle required is just standard gear with the exception of leader material and fly pattern. Nothing less than 10lb BS in the Double Strength or Fluorocarbon types, or 8lb in the conventional mono should be contemplated as these fish are incredibly fierce on the take and breakage’s are common with anything less. Floating and occasionally intermediate fly lines are all that’s required whether wading or afloat, with some regulars using shooting heads to good effect when extra distance is required. Fly pattern is usually something of personal choice and what you have confidence in, hands up all those out there, including myself, who cannot catch anything on a Peter Ross when all and sundry are coiling fish in on it, well you know what I mean. I had old favourites that caught odd fish in North and Bea, White Hackled Invicta, Kingfisher Butcher, Dunkeld to name but a few, but fish were really quite rare. My success rate was transformed following a couple of evenings on Bea with top Shetland angler and specimen hunter Davy Pottinger and further conversations with another of Shetland’s top anglers, Brian Watt, both of whom had fished the Sanday Lochs for numerous years, and renowned for their expertise in catching large trout. The most important piece of advice was given by both anglers; basically it was big fish, big fly, and they did not mean a bushy size ten! I could hardly believe my eyes that first night I fished with Davy and to be honest, I thought he was having a joke. On the top dropper of a two fly cast was what he proudly called Pottinger’s Palmer, the exact dressing of which I will give later but it was to all intents and purposes an Orange Palmer tied on a long shank size 10 nymph hook and heavily hackled. The point fly was a lure more at home on rainbow trout fisheries, and with a name like the Idiot Proof Nymph or IPN, I really was convinced that this was a wind up. The next couple of hours proved to be the biggest lesson in angling that I have ever had. Mr Pottinger proceeded to hook five fish that evening, all in the 4-7lb class, lost three and landed two belters, both about the 5lb and each carefully returned. The IPN on the point was the fly they all latched on to but the bright bob fly was imperative in creating the initial interest and, according to Davy, “steers them up”. Who was I to argue, I had not moved a fish all night and had been through the fly box but they were “far too peedie” according to the man. I had been kindly given both of the successful fly patterns early on in the night, but for some strange reason, probably something to do with pride and stubbornness, I did not fish them but kept trying my own flies in the hope of redeeming myself, a lesson I shall not forget. If somebody ever gives you “the fly”, in whatever context, take my advice and give it a swim immediately. That evening completely changed my attitude and approach to fishing the Trophy lochs, it proved that hooking these large trout was possible on a regular basis, if the correct tactics were employed, and in the following couple of seasons I had the opportunity to experiment with these large flies. The results were very satisfying and to date my best fish weighed in at a guesstimated 8lb+ but more importantly, given reasonable conditions, fish are hooked with more consistency. The most successful flies will be surprising to some, but I just based my thoughts on the simple maxim of something bright and bushy on the top dropper and a weighted long shank lure on the point. 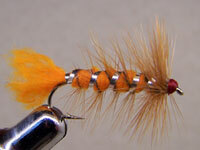 The traditionalists among you are not going to like this but the bob fly which was an absolute revelation when I finally got round to trying it was the Fire Red Blob and it is never of my cast these days. The point fly which is most consistent is again another weighted lure called the Hummungus, the origins of which are still widely debated but its effectiveness is beyond doubt. 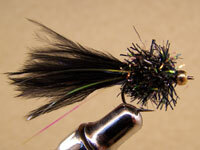 The one fly which breaks the mould as it were from these reservoir type flies is the Black and Magenta Muddler, courtesy of Brian Watt, a brilliant fly later on at night when the fish are moving into the shallower water to feed. The dressings of all these patterns follow. On Bea and North Lochs, there are definite drop-offs and shelves along their shores, these are easy to spot, and these are where you should concentrate your efforts. In daylight hours, casting out into the deeper water and retrieving up the shelves is most productive, while in lower light conditions, casting along the slopes and up on the shallow side can provide a result, and a word of warning here. I once covered a small dimple of a rise in about a foot of water, on the first pull of the retrieve everything went absolutely solid, no swirl, and no movement. My immediate reaction was one of annoyance, mistakenly thinking I had hooked the bottom, I proceeded to hoick the rod up and down in an attempt to dislodge the hook. About 6lb of North Loch brown trout took exception to this and erupted skywards in the shallow water, and we parted company in an instant, what disappointment, so beware. In the summer months, fishing the deeper water, especially around the numerous weed beds on the Bea Loch is probably the best tactic. Boat hire is available on both lochs, and will greatly improve your chances, details to follow. Finally, another word of note. Please take great care of and respect the surrounding farmland and animals, gates and fences, and a word with the landowner before accessing the lochs is only common courtesy. All information regarding accomodation,hotels,guest houses,boat hire etc can be found at www.sanday.co.uk or the Orkney Tourist board.